Here comes a good news (at last) for the owners of the original Samsung Galaxy Tab and the Samsung Galaxy S - these devices will be finally treated to the Gingerbread update. They will be joined by the Samsung GALAXY Ace, Gio, Fit and mini, which will also receive their Android 2.3 dose. The news is as official as it could be, as it's Samsung that is disseminating it - the Korean manufacturer issued a press release that states the Samsung Galaxy S users in the Nordic countries and the UK will be the first to taste Android 2.3. 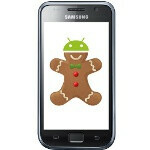 That will happen in mid-May, while from then on owners of the other above-mentioned Samsung devices in other parts of the world - namely other European markets, North America, Southeast Asia, the Middle East Asia, Africa and rest of the world - will get Gingerbread "according to the regional plan". As there is no information about the North America regional plan, we can only guess when exactly we will see Android 2.3 on the Samsung Galaxy Tab and the Samsung Galaxy S, but at least it's now certain that Gingie is coming to these devices. so what about Galaxy 5 (i5503) Android 2.1 india . It will get Android 2.3 or Android 2.2 ? . They did not mentioned, so what happened Galaxy 5 ?